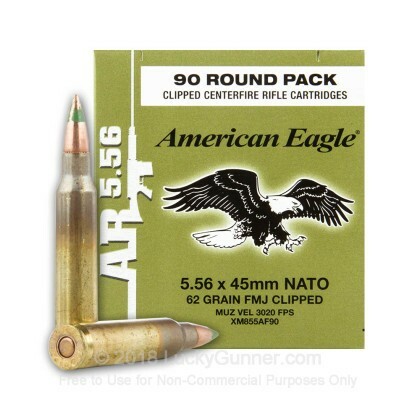 This 5.56 NATO military surplus ammunition is manufactured at the Lake City Army Ammunition Plant in Independence, Missouri by defense contractor Alliant Techsystems and sold under the Federal American Eagle brand. As excess production for military use, it is highly sought after by AR-15 owners for its consistency and mil-spec authenticity. At the same time, it's inexpensive enough to use on the range in significant quantities! 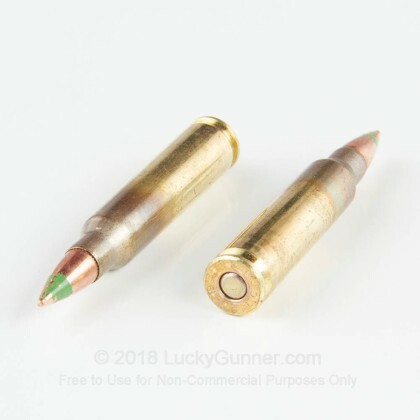 These cartridges are packaged in economical loose boxes of 90 and follow the M855 specification, firing a heavy 62 grain full metal jacket bullet with a distinctive painted green tip. The bullet achieves a muzzle velocity of about 3,100 feet per second from a 24 inch barrel. 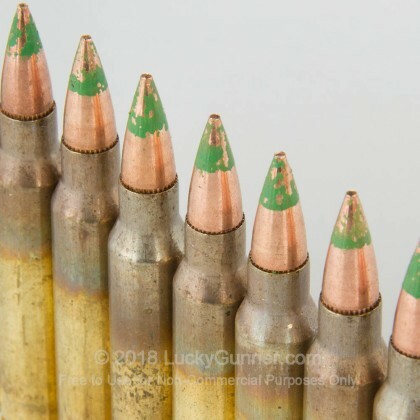 As military rounds, these cartridges display visible evidence of case annealing on the brass. This is typically removed by commercial manufacturers for aesthetic reasons but actually serves as proof that the round was manufactured correctly. 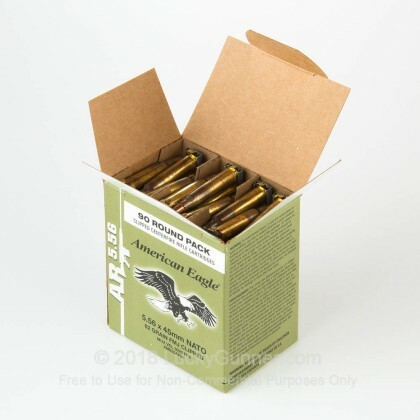 Like other Federal products, this ammo uses non-corrosive Boxer primers. 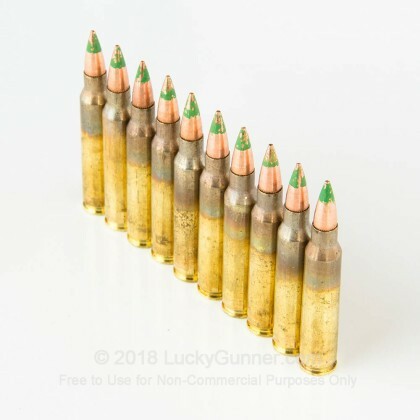 If you have a rifle chambered in .223 Remington, you may want to check with the manufacturer before using 5.56 NATO cartridges such as these. Most .223 guns will fire 5.56 with no problems but a few will have trouble with the slightly higher pressures of military ammo. Received fast, everything worked as expected, no FTF or FTE, is more accurate then I am, no issues for me at all, for the price I will be buying more. I like this ammo. It makes almost the same velocity as 55 gr M 193 ammo from my Arsenal SLR-106 AK with a 16" barrel. Who has a 24" AR or AK for that matter? This ammo makes 2922 fps 10 shot average from my rifle. A: Hi Dave. I do not recommend using this for home defense purposes. Due to the steel penetrator in the projectile, the bullet will end to over-penetrate and possibly endanger others in the home. The 55 grain FMJ or an expanding tip bullet is a better choice. Neither have a bullet design that will tend to over-penetrate. Q: Are these on stripper clips or not? No mention in the description but box in pix says clipped. Which is it? A: Hello Dave, I appreciate you reaching out to us about that ammunition. 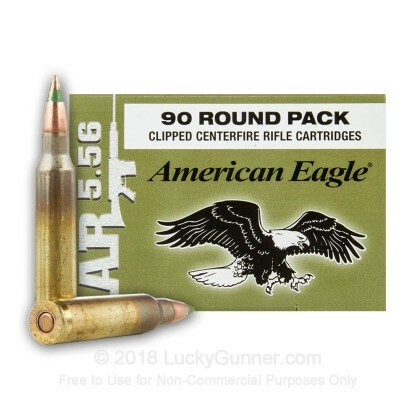 These rounds do come on stripper clips. They come packaged in 90 round boxes with 10 rounds per stripper clip. A: Hello Bob! This Federal Lake City ammunition is loaded with the SS109 projectile. The SS109 projectile is the designation for the 62 grain steel penetrator. If you have any other questions, please do not hesitate to ask!